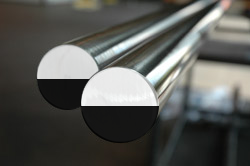 Best Stainless is proud to offer type 410 QDT stainless steel bars, suitable for petrochemical applications such as oilfield sour gas hydrogen sulfide (H2S) services. Each bar is double tempered to relieve internal stresses and to guarantee that no untempered martensite remains in the steel. Best Stainless 410 QDT stainless steel bars boast a minimum yield strength of 80 KSI and a hardness of RC22 max. These attributes are in compliance with standards set for H2S-containing environments, NACE MR0175 and/or MR0103. 410 QDT SS bars also meet AP1 6A standards, making them optimal for resisting corrosion during petrochemical applications such as sour gas H2S services. * Mechanical requirements more restrictive than referenced specifications. † Minimum Average of 3 greater than 20ft/lbs (none less than 15 ft/lbs, two must be at or over 20 ft/lbs).